Five years from now, over one-third of skills (35%) that are considered important in today’s workforce will have changed. By 2020, the Fourth Industrial Revolution will have brought us advanced robotics and autonomous transport, artificial intelligence and machine learning, advanced materials, biotechnology and genomics. These developments will transform the way we live, and the way we work. Some jobs will disappear, others will grow and jobs that don’t even exist today will become commonplace. 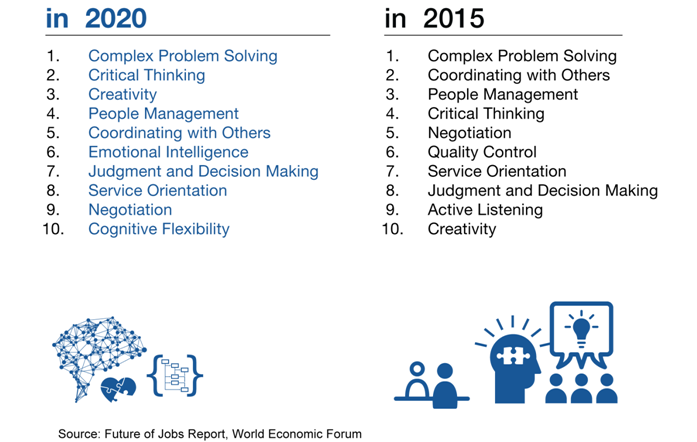 What is certain is that the future workforce will need to align its skillset to keep pace. A new Forum report, The Future of Jobs (http://www.weforum.org/reports/the-future-of-jobs) , looks at the employment, skills and workforce strategy for the future. The report asked chief human resources and strategy officers from leading global employers what the current shifts mean, specifically for employment, skills and recruitment across industries and geographies. The INNOVATION 4.0 Curriculum presents a disruptive educational approach to Leadership and Innovation with an emphasis on Talents that cannot be automated and are correlated with long-term high income potential. The INNOVATION 4.0 Curriculum is designed to be taught by any adult to any audience – there are no technical or “STEM” (Science, Technology, Engineering, Math) skills present in the Curriculum. Instead, the Curriculum is meant to be utilized by teachers, parents, coaches, mentors, administrators, and others, as they prepare future leaders and innovators to embody their values, build trust, harness their inspirations and frustrations, create, collaborate and communicate, tackle the world’s greatest challenges, and launch future-proof careers. E-mail curriculum@curtisleadershipfoundation.org for more information on how you can use our curriculum in your program. As well as TED Talks like Simon Sinek’s Golden Circle and Keynotes like the iPhone App Store Launch. The Police Athletic League (PAL) partnered with the business community in early 2017 to pilot the INNOVATION 4.0 educational curriculum, completing pilots in Cleveland, Ohio and Flint, Michigan PAL chapters representing 40 students from 3 public high schools. The pilot was a huge success, and drew high praise from participants and parents. Now, National PAL and its partners are preparing for national distribution of its educational program to 500 PAL Chapters nationally. E-mail curriculum@curtisleadershipfoundation.org for information on how you can use our curriculum in your program.